But as most of us have discovered, that’s not quite how it works. 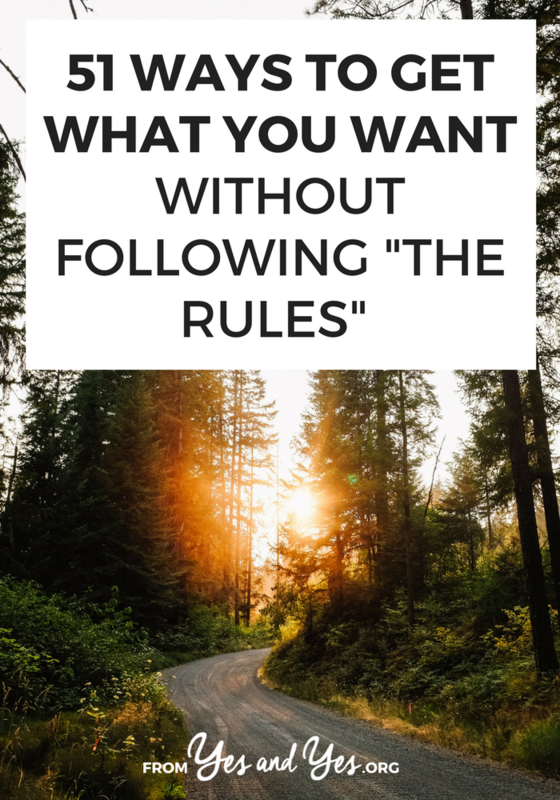 Following ‘the rules’ doesn’t necessarily get us where we want to go. The years of education and school debt don’t always lead to the dream job. The $4,000 vacation isn’t necessarily stress-free and magical. The book deal isn’t a proven route to fame, fortune, and critical acclaim. But what are the other options? When everyone around us is going about life and dreams and goals the same way, it’s hard to imagine a different approach. If everyone I know is getting an MFA in Creative Writing, it probably wouldn’t occur to me that I could join a writing group, take classes at The Loft, start a blog, and get serious about my morning pages. Where would I even get that idea? We can’t be what we can’t see. After years of following The Rules (unnecessary Master’s degree, logical career path, nice boyfriend who wanted kids when I didn’t), I threw in the towel. I built a life that worked for me, making up my own rules as I went along. I got creative and strategic and I got what I wanted on my own terms. If you want to acquire new professional skills, you could go back to school. If you want to travel, you could save up thousands of dollars for hotels and restaurants. Join your friend or partner on a business trip – free lodging! If you want to meet someone, you could join an online dating service. Go places where people who share your interests hang out – rock climbing gym? Improv class? If you want to be a writer/artist/creative, you could get an MFA. Create Instagram and Pinterest-friendly images with your words on them. Share them. If you want to expand your professional network, you could go to a million conferences and networking events. But I want to hear from you! Have you ever gotten something you wanted by taking a “less-traditional” route? Tell us about it in the comments so we can try your route! * I would never dissuade anyone from asking for a raise. If you’re a woman, you’re probably underpaid anyway! I’m just trying to illustrate the point that there are lots of ways to have more money than waiting for your boss to give it to you. I am embarrassed to say that at 42 I’m just now looking at this in my life. I pride myself on being an independent thinker but I have started to realize more and more how much I have based decisions on how things are “supposed” to be. Thanks for a great post. You shouldn’t be embarrassed. Some people go their whole lives never realizing that there is more than one right way to live their lives. Be proud that you’re still learning, changing, and growing! I learned how to cook, negotiate my bills, and change my oil from watching my roommate. I knew I wanted to learn those skills when I met him, and you could say he has taught me a lot about being independent. This was an alternative to paying for cooking classes or seeking out multple people to teach me each skill separately. MY POINT IS… when you know what you want, you can attract friends who can help you get there (just by being themselves). And my favorite one, if you are a woman: Get your blood levels tested and act on the results. It might be that you aren’t “just not good at sports”, but physically unable to get better at it because your iron levels are lousy. I feel like my 20s was all about struggling because I was not taking the beaten path. I now realize I was choosing not to, because I somehow felt that wasn’t the path for me. But I was still struggling with not having found that corporate job, those roots, that circle of friends – not that I was pursuing any of those things. I just felt oddly guilty for not wanting them in the first place. I wanted to learn how to cook, so I became a personal chef. As a single person, I didn’t cook nearly as often as I’d like, and end up eating the same thing for days. It was difficult to get enough practice in. I mentioned it to a friend who hired me to cook for her and her family. My friend is an elite athlete who wanted help preparing for a milestone event. She needed a ton of protein (150 grams/day) and so I planned several meals around that. Then I arrived at her house and realized, I’d never even cooked on a gas stove! It all worked out. For months, every time I’d call, she’d answer, “I love your food!” The diet helped her develop lean muscle and drop body fat, and she ended up being the fastest woman in the world in 4 categories. During that time, I ended up cooking over 200 new recipes, and learned a lot. That’s so cool, Traca! It’s awesome to hear that you were able to support your friend’s goals while achieving your own! Looking forward to stretching outside the box. ? I scoffed at living by the rules for years and had a marvelous time… but I was broke. Now, I have my own business, a house and kids to raise and it seems like I’ve just fallen right into the trap. These are good suggestions to take to heart… so I’m going to give it a try at going back to my roots.